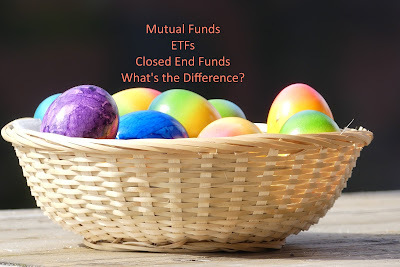 Mutal Funds, ETFs, Closed End Funds--What's the Difference? One key rule in investing is to not put all your eggs in one basket--or all your money in the stock of one company. No matter how great the company, no matter how long it has been in existence or how well known it is, it could fail--case in point: Sears. While Sears has not yet filed for bankruptcy (at the time of this writing), "word on the street" is that it is coming. Sears has been a retailing giant since the 1800's and sent packages through the mail long before Amazon came into existence. The problem with buying a large number of investments is that researching them and following them takes too much time, even if you have learned how to do it. Yes, there are investment geeks out there who love reading annual reports, who know what PEG, PE and EPS mean, and who revel in uncovering stocks no one else has heard of, but most of us would rather go to the beach, and outsource the job. Of course investment companies have seen the need and developed products to meet that need. Today we are going to take a look at three types of products you can buy that basically pool your money with that of other investors to buy shares in many companies. Open-ended mutual funds are still the most common type of pooled investment vehicle, but Exchange Traded Funds are making headway. With an open-ended mutual fund, a custodial company develops a plan stating the types of things in which it will invest, as well as the long-term goals. This plan, which is described in a Prospectus gives investors some idea of what they are buying--is it stocks, or bonds? Big companies, or little? Is the goal current income or increasing share price? Are people picking the investments or is a computer matching an index? An initial share value is established and as investors send in money, the fund managers invest it per the prospectus. If the initial share value is $10 and your money gets there the first day, you purchase one share for every $10 you invest. As the purchased investments appreciate (get more valuable) or decrease in value, each share price adjusts proportionately. Every day at the end of the day the NAV or Net Asset Value per share is computed. With open-ended mutual funds, investors can buy more every day, and new shares are created, priced at the same NAV as the old ones are that day. As more money comes into the fund, the fund managers invest it. If more investors want to withdraw funds than contribute, then the fund managers have to sell assets, whether or not they think doing so at this time is wise. As money comes in, the managers have to invest it per the prospectus--for example, if the prospectus limits cash to 10% of the fund assets then once cash reserves exceed 10%, they have to be invested per the prospectus, regardless of whether the managers believe it is the ideal time to buy those investments. Open-end mutual funds are the most common investment offered by 401(k) plans. There are thousands of funds with a variety of investing styles and goals. Mutual fund investments are made by dollar amount, not by share amount, and most fund companies require an initial minimum investment. Exchange Traded Funds are similar to open-ended mutual funds, except that while mutual funds are valued at the end of the day and everyone who buys and sells shares that day gets the same price, ETFs are valued minute by minute as the value of the owned stocks change. If you buy an ETF for $10 per share in the morning, I may be able to buy the same ETF for $9.00 per share in the afternoon--or it may cost me $11.00. Because the price of the shares fluctuate throughout the day, ETFs are purchased by shares, not by dollar amounts, so you only need the cost of one share to start an investment. They also can be bought or sold almost instantaneously, depending on your broker, so if you want to time the market, or set stop-loss or limit orders you can. Some brokers charge a commission for buying or selling ETFs, though generally if you purchase directly from the managing company, there is no sales commission. A closed end mutual fund is one in which a limited number of shares are sold. If someone who owns shares in a closed-end fund wants to sell them, they are sold on the stock exchange for whatever price can be obtained, which may be the same, more, or less than the proportionate value of the fund assets. For example, FundA may be, for simplicity sake, invested 1/4 in ABC, 1/4 in DEF, 1/4 in GHI and 1/4 in JKL today. The NAV of the shares is $10.00, so each share of FundA represents $2.50 of each company. Tomorrow, there is really bad news about ABC and the price drops by 20%, and the other companies' price remains the same. Now, the NAV of the shares of FundA is $9.50. If FundA was an open-ended mutual fund, and it received my order for shares tomorrow, I would pay $9.50 per share--and that' s what you would receive if you wanted to sell. However, with a closed-end fund, if I wanted to buy shares in FundA, I would have to go to the stock exchange, and pay the going rate, just as if I was buying the underlying stocks. It is not uncommon for closed end funds to sell at a noticible discount or premium to the NAV. If more people want to buy FundA, then the price goes up; if "everyone" wants to sell, the price goes down--however, there are still the same number of shares of FundA in existence, and each share is still invested in ABC, DEF, GHI and JKL. For fund managers, the advantage of closed-end funds is that they have a set amount of money with which to work. With open-ended funds, if there is a large in-pouring of assets, then fund managers may have trouble investing it in companies in which they believe and in accordance with the fund prospectus. Closed-end funds don't have that problem. In the same way, if too many people want to withdraw money from open-ended funds, the managers can be forced to sell assets when the value is down. With closed-end funds, the investor might suffer a loss in that situation, but the fund as a whole would not. Investors benefit because without having to manage funds coming into and out of the fund, the operating expenses of a closed-end fund are less than that of an opened ended one. Further, if you are looking for income, closed end funds tend to pay shareholders regularly--passing on both the dividends paid by the underlying stocks and the capital gains earned when stocks within the portfolio are sold. I own a few shares in a closed-end fund--Liberty All Star Equity Fund (USA), which is a large cap fund. Its major holdings include Adobe, Visa, Amazon and Alphabet. You can read more about it here. Liberty tries to pay out 2.5% of the Net Asset Value of the fund each quarter to shareholders, which means it is good for those who want income. Today it is selling for 6.99% less than the NAV. On the other hand, a sister fund focused more on growth is currently trading at 6.6% more than the NAV. So, is buying this fund a guaranteed 10% return annually? No. If the fund does not have enough earnings to cover the distribution, it makes up the deficit by returning capital to the shareholders; in effect giving you some of your money back, which of course lowers the NAV (and probably the market price) of the shares. Still, if you want to know that on four days of the year, you will receive a check for more or less an amount of money, closed end funds may work for you. Overall, USA's annualized performance over the last ten years has been 8%, which is slightly less than the 9.62% return of Vanguard's Total Stock Market Index Fund, and slightly more than the Lipper Large Cap Core Average, which the fund considers to be its benchmark. You've decided to do it. You are going to invest in stock--you are going to buy shares in some company, rather than a mutual fund of ETF. Now, how do you pick which one. One way that has been successful for many people is buying what you know--if there is a business you patronize and love, buy a part of it, or at least use a list of such companies to begin your research. Another way is to set some basic criteria, run some computerized screens on those criteria and then further research the results of those screens. The advantage of this method is that it can call to mind companies you had no idea existed. While a computerized screen should not be your only criteria for investing a substantial (definition of "substantial" varies by person) amount of money in a company, computerized screens are good for eliminating companies from consideration. 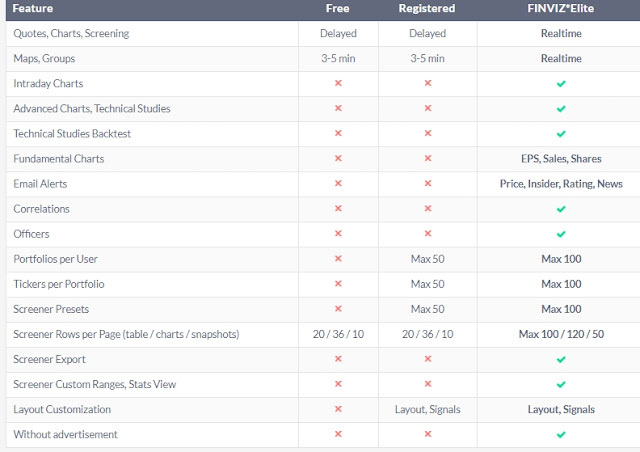 Let's take a look at some available on-line stock screeners. 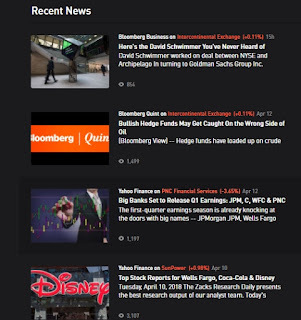 To use Finviz, you simply go to their homepage, click on screener and, for the most complete screen, click on "All". (The other choices are "Descriptive" "Fundamental" and "Technical"). Click the boxes on which you want to screen, enter the criteria that interest you, and then look at the results list. As an example, I want to invest in a small cap company that is profitable, has increasing earnings per share and has a dividend above 3%. I'm not saying this screen will result in outsized earnings, I just needed something to start with and that's what I picked. Finviz' screener covers 7319 companies. Screening for small cap reduced the number to 1564. Asking for dividend yield over 3% cut that to 372. When I added in positive earnings per share growth this year, the number went down to 148. Setting "net profit margin" to positive, further reduced the list to 107. Once I've gotten a number of stocks with which I can work. I can design my own report using the screening criteria I used, or another criteria. For example before I buy this stock, I want to know if their sales are increasing, and what the price/earning ratio is. I go to the report tab, click those buttons, along with dividend yield and then I take a look at my report, which I can then sort on any criteria I've included in the report. In this case, I decided to sort on Sales Growth in the last five years and Jupai Holdings, a financial management company from China comes to the top. Interesting; this would NEVER have come on my radar in much of any other way. So, should I buy it? Well, when I click on that stock, I get a page filled with data about it,and a quick eyeball shows that it is a growing and profitable company but that the stock price is volatile and down for the last three months, but that it doubled in the last year. If I continue down the page I see a slew of articles about the company, including one published this week on Simply Wall Street titled Top 3 Cheap Stocks This Month. There is also a link to their annual report. The main downside to Finviz is I think the page is unattractive and hard to read. Also, unless you buy the premium version there are ads, including videos and I hate video ads. Yahoo offers a stock screener as well. While it does not say how many companies it starts with, when I clicked "Small Cap" I got 5245 results. When I went to look for dividend yield, I couldn't find it, so I hit control-f and let the computer do it for me. I found one that was dividend/stock price, so I clicked it. For earnings per share I clicked net EPS--basic. The trouble was that once I clicked those, instead of being able to set them where I was, I had to go to another screen, and though I set the dividend screen to what I thought was the equivalent of dividend yield, I ended up with stocks with dividend yields that were less than 3% (and some more) so obviously I did it wrong. 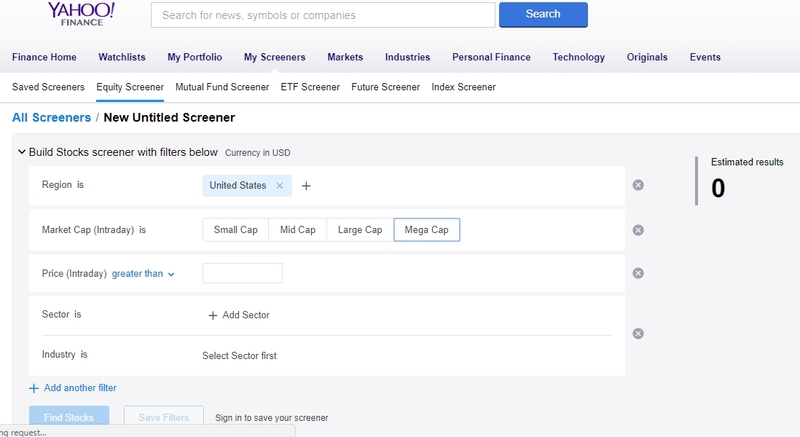 In general I had a harder time navigating Yahoo's screener and I wasn't able to select criteria that I knew were equivalent to those I picked for Finviz (and vice versa). I guess knowing something about finance would be useful. For whatever reason, CVA Covanta Holding Corporation was at the top of the list Yahoo gave me. I clicked on it and was taken to Yahoo's page on Covanta where you can see there is a lot of information, including the fact that it is considered a strong "buy" right now. 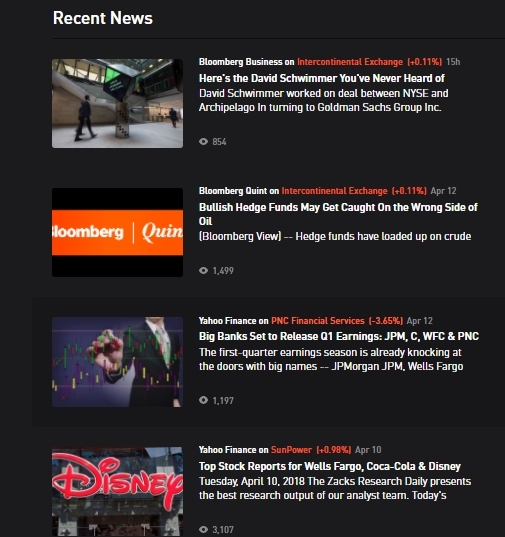 This page is easier to read than the individual stock pages on Finviz, and seems to have much of the same information. In short, I prefer screening the stocks on Finviz, and then reviewing the "winners" on Yahoo finance. Zacks is helpful because it defines the various screening criteria and tells you what it thinks are reasonable values. I screened for market cap under 1000 per their criteria for small cap. I picked a dividend yield of greater than or equal to 3%. My screen selected 98 stocks. Interestingly, neither of the stocks discussed above were on that list. 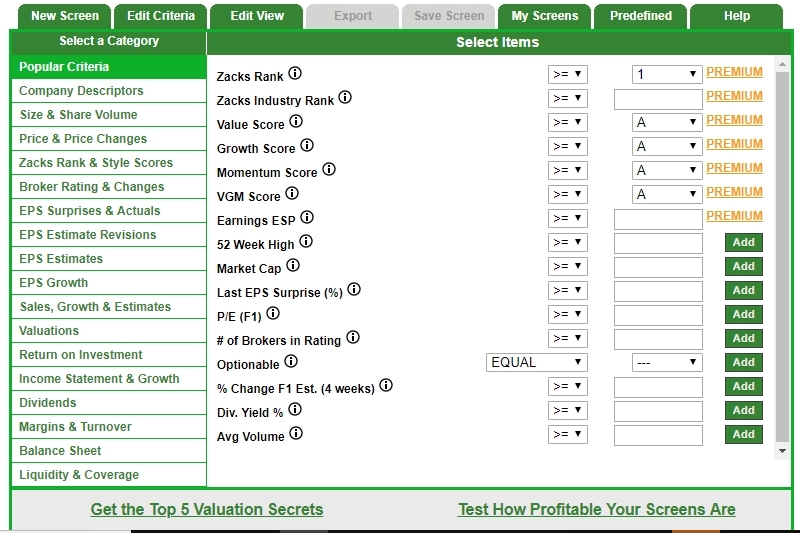 Zacks listed the stocks in alphabetical order but allowed me to sort by any of my criteria. I sorted by dividend yield and the top one was Independence Realty Trust, and clicking on the name took me to Zack's page on it. I found the page easy to read and liked the fact that one of the top things you see on the page is Zack's recommendation about the stock--in this case "sell". The other thing I like is the little i buttons next to some terms. While Zack's is selling a premium service and therefore paywalls a lot of their information, there is still plenty available to those who do not subscribed. Are there any stock screeners you like to use? 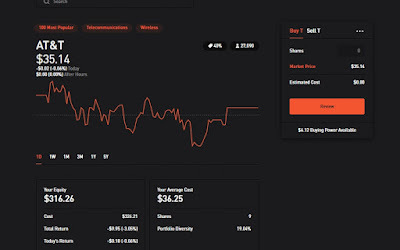 I've written several times about my experience with Robinhood, an online broker that allows investors to buy and sell shares of stock, ETFs, options and even cryptocurrencies without paying a sales commission. Up until recently, the only weakness I found was that Robinhood required you to use a smartphone app; the website was not much more than a landing screen directing you how to download the app. However, the last time I went to their website, I found something new, and it looked a lot like what you see above. Yes, you can now buy and sell via Robinhood's website. So, let's take a look at the website and its features. Beauty is in the eye of the beholder, and this beholder doesn't much care for the black background with white print. The screen you see above is what I see once I've logged in. You can see that my portfolio lost value today ($5.52) but then gained in after hours trading ($1.88). On the right side of the screen, you can see a list of the stocks I own, and how much each is worth, as well as a chart showing its progress today (green for gain, red for loss). If I click on the symbol for a stock, I am taken to a page like this. You can see that today, AT&T decreased in value, per the red chart. It shows that the current value of my AT&T shares is $316.26 and that my average price per share is $36.25. This screen also tells me that I own 9 shares of AT&T and that they make up 19.04% of my portfolio. From this screen I can both buy and sell my shares, and it tells me I have $4.12 buying power at this moment. I would guess that this is all pretty standard stuff for a stock brokerage. 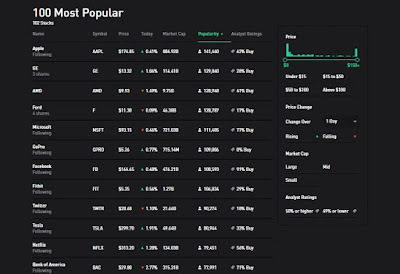 This particular collection is a list of the 100 stocks most popular with Robinhood investors. 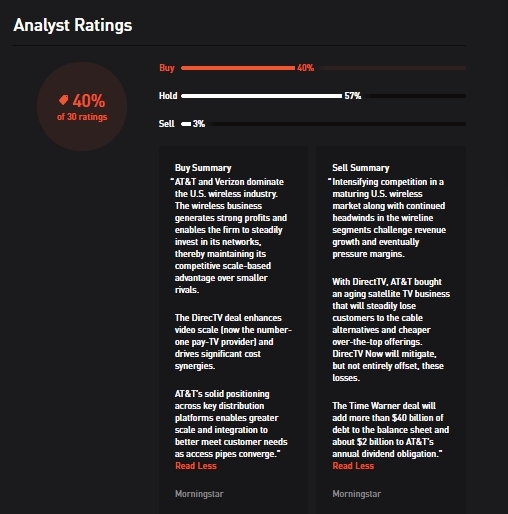 Besides the current price and how the stock performed today, I can see what percent of analysts recommend the stock. On the right side of the page is a simple stock screener that I can apply to the current collection. Of those 100 most popular stocks, only are recommended by more than half the analysts. Of those, only four are small cap companies. Three of those deal with drugs or health, and one, Plug Power, which I had never heard of before starting this article, provides alternative energy technology. As happened when I clicked the AT&T symbol on my homepage, clicking the Plug Power symbol took me to a page about them. 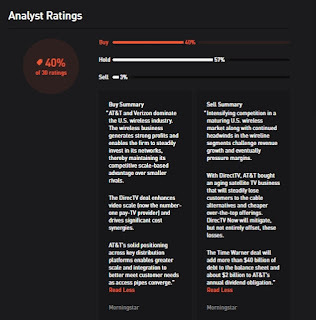 I like the way it shows both points of view and tells you that 40% of analysts recommend buying AT&T, 57% recommend holding it, and only 3% recommend selling it. I wish I knew how many analysts they polled, and who they were. Perhaps Robinhood plans to monetize that information later, but right now, I don't see any way to access it. Still it is good information to use to screen stocks to pick those worthy of further investigation. As I continue down the page, I see what is above--a graph of AT&T's earnings per quarter and my history with the stock at Robinhood. 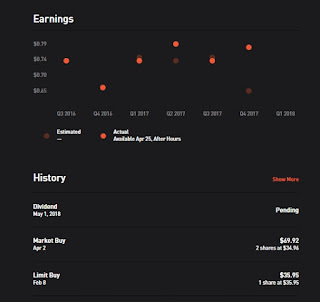 You can see that I will get a dividend on May 1 and if I click the word "Pending" it tells me that I'm going to get $0.50 per share for a total of $4.50. Some stocks also have links to articles about the company and its potential as an investment. Finally, the front page offers me links to articles. From what I can see, these, shown above, are just articles of general interest to investors as opposed to articles about my stocks. I was a late adopter of smartphones--I got my first one a Christmas, and one of the reasons I wanted it was to run the Robinhood app. At this point, the app is easier on my eyes but the website has more information. Interestingly, the app also has the black background with white letters and it doesn't bother me. Neither "collections" nor analysts ratings have made it to the app at this time, so I think if you are looking for a company in which to buy stock, more information is available on the web (and I prefer a keyboard and screen for any serious research. 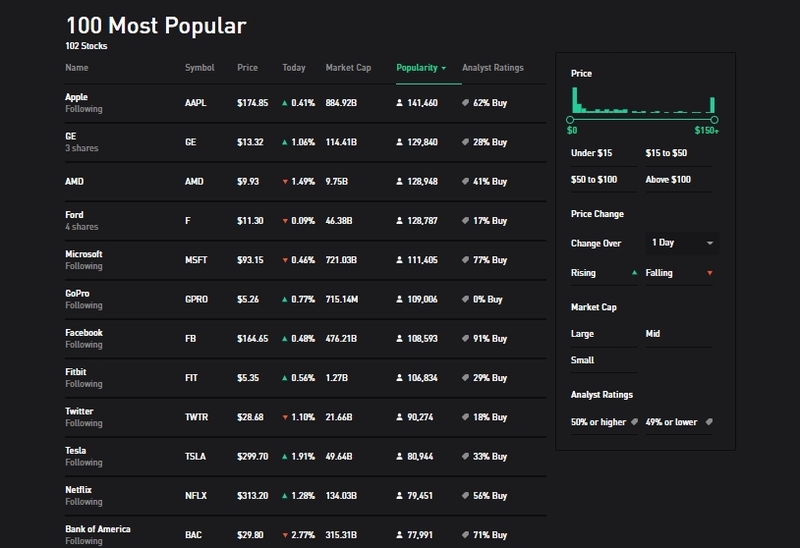 How Does Robinhood Compare to Other Options? Robinhood wins many comparisons to other online brokers. I have reviewed Stockpile, which offers gift certificates and supervised trading for minors. Robinhood does not offer either one, but it also does not charge $0.99 per trade, and it offers a much larger variety of investment choices. Stockpile offers fractional shares, whereas Robinhood does not. 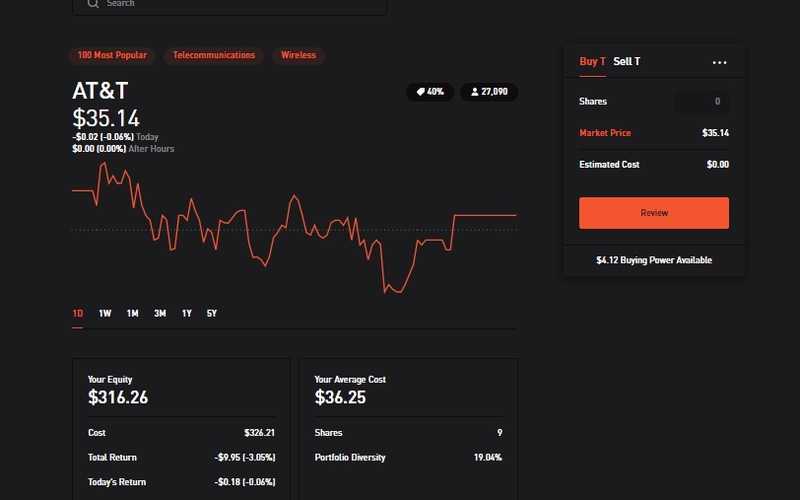 Stockpile engages in once per day batch trading, Robinhood offeres real-time trades. I prefer the appearance of Stockpile's website. If you want $5.00 worth of free stock, use this link to open a Stockpile account (and I get $5.00 too). Motif offers free first opening price trades, or you can pay for real-time trades. However, if your account is under $10,000 Motif charges you a $10 account fee every other month. Also, Motif has started charging a fee for owning one of the "motifs" or baskets of stocks that they designed. Robinhood offers real time trades and no monthly account fees. While Motif allows the purchase of factional shares, Robinhood, as stated above, does not. Vanguard is my favorite mutual fund company, hands down. They have a large portion of my net worth under their umbrella. However, I just "tried" to buy stock from them. The interface was easy, and I had no problem setting up the order. However, there was a $7.00 commission whether I was buying one share or a thousand. Clearly buying individual stocks via Vanguard is not realistic for people who don't want to invest a lot of money in any one company. If a company is going to stay in business it has to make money. Otherwise, it ends up going out of business, like Loyal3 did, or it has to change its business model and start charging fees. Motif, for example, used to charge a $9.95 commission to buy or sell a "motif" or basket of stocks, but no monthly fee. Now they've reduced sales commissions but added a monthly fee for small accounts. Robinhood says that they make their money by charging for Robinhood Gold, which is basically a margin account that allows after hours trading, and by the interest earned on uninvested money in stockholder's accounts. If you would like to invest with Robinhood, use my link and we'll both get a free share of stock. The last free share I got was Sprint, which has increased in value by 15% in the last month. Fill out a few simple forms, link your bank account and you are ready to go. Robinhood will even let you instantly invest up to $1000 that is en route from your bank to Robinhood. 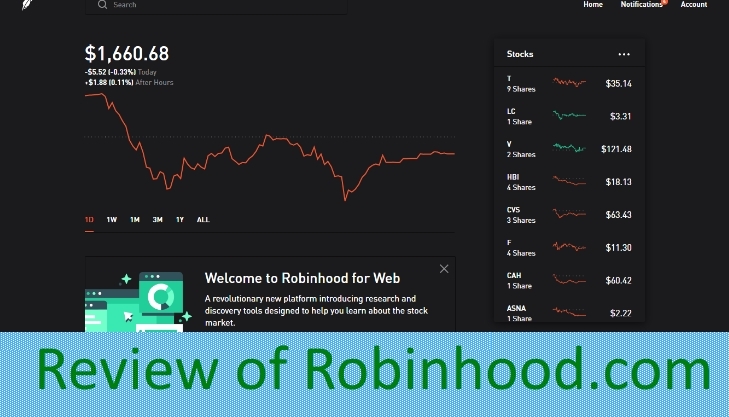 While full service brokers may offer features Robinhood does not, if you are looking for a place to dabble in the stock market without paying a lot of fees, Robinhood is a great fit. It was the best of times, it was the worst of times....where have I read that before? Lending Club in an on-line unsecured lender. If you want a debt consolidation or vacation loan, give them a try. They accept applications and underwrite and service loans, but they don't lend out their own money, they lend out the money of investors who invest in particular loans. If the borrowers default, the lenders lose money. The hope, of course, is that the interest collected from the borrowers who pay offsets the write-offs. According to figures published by Lending Club at the time I started investing, the overall return from which it was hard to stray was about 8%. Now, that norm is about 5%, which to me is not high enough to make up for the expected drop should the overall economy drop. Right now, my returns since I started on the platform are about 4.51% if you take into account my expected defaults. That number was 4.58% at the end of the year. The good news is that for the first time in a long time, I earned more interest than I lost in defaults. Still, I'm in the process of pulling my money from that account as notes are paid. Prosper is a platform similar to Lending Club. In December I reported "Three months ago my annualized net returns were 5.41%, and my "seasoned" returns--the returns on notes that are more than ten months old were 4.82%. Those figures have dropped to 5.09% and 4.39%, ". Now, the figures are 4.56% and 3.93%. Again, this return is not high enough to compensate me for the possibility that defaults will increase due to declining economic conditions. As I withdraw money from this account it is going into our Roth IRAs. That's slightly off from my target, but surprisingly, given the last few weeks, it is the stock funds that are slightly overweight, not the bond fund. Nevertheless, my 401K is worth less than it was when the year began. My husband's 401k is invested about 50/50 in a bond fund and a small cap growth fund through AXA. The fees are high and the funds mediocre, so he invests the minimum for the company match. Vanguard holds IRAs and Roth IRAs for me and my husband and a joint non-IRA account. Each acccount holds a variety of funds purchased for us by our ex-financial advisor. I check them quarterly and if any have been significantly underperforming compared to their index, I consider selling them. Otherwise, I leave them be so as not to pay the sales cost. Out of 14 funds, 2 are under consideration for sale (we've already sold five or six funds from each account). We run our numbers through Personal Capital and it tells us that our allocation is just about right. Motif is an online broker that appears to be trying various pricing plans to see what works. Originally, they were selling "motifs" or baskets of themed stocks. You paid one commission and you could buy up to 30 different stocks. Later, they introduced a yearly fee for accounts under $10,000 from whom they got no commissions. Now, they have a bi-monthly fee on low accounts and they charge a fee per motif if they designed the motif. On the other hand, if you are willing to accept tomorrow's opening price, you can now buy and sell stocks at no cost, and you can do so by share or by dollar, since you can buy fractional shares. With the new pricing model, I sold one motif that was not doing well as a whole. I am adding money so as to get my account over $10,000 by the time the next bi-monthly fee is charged. Like the stock market in general, my holdings at Motif have decreased in value, so it seems that I'll about hit $10,000 and then the market will drop. If you want to invest via Motif, use my link, and you get a month of their premium service, which includes real-time trades for free, and so will I. Lending Club: 1 share purchased at $5.51. Current price $3.41. No dividends. No stop loss. Visa: 2 shares purchased at $78.00. Current price $117.00. Latest quarterly dividend was $.21 per share, up from $0.195 in 2017. I have a stop loss order placed at $100.00. Hormel: 3 shares purchased at 33.91. Sold at $34.00 via stop-loss order. Repurchased at $31.80. Current price $36.39. Purchased June 21, 2017. Quarterly dividend in 2017 was $.17; in February it paid $0.1875. Hanesbrands: 2 shares purchased at $21.93 on January 13, 2017. Current price $18.75, Stop loss set at $18.00. Dividends in 2017 were $0.15 per share per quarter. 2018 has been the same. Additional shares purchased February 7 for $21.60 and February 9 for $19. Stop loss sell of two shares on April 2 for $18 each, repurchased at $17.95. Now my average cost per share is $19.53. CVS: 1 share purchased July 3 for $80.77, one share on February 9 for $70 and one on March 13 for $68.66. Current value $63.49. $1.00 in dividends in 2017. No stop loss. Quarterly dividends are $0.50 per share. Qualcomm: 1 share purchased October 9 for $52.68. Stop loss sell on March 13 for $59.65. Collected two dividend payments of $0.57. Current price: $53.30. Mattel: 1 share purchased October 30 for $13.87. Current price $13.15. $15.00 stop loss sale on January 18. Ford: 3 shares purchased November 7 for $12.33. Stop loss sale on January 25 for $11.50. Repurchased February 1 for $11.00. Another share purchsed April 5 for $11.37. No dividends. Cardinal Healthcare. 1 share purchased November 27 for $56.42. Stop loss sell February 5 for $64.98 and repurchase for $64.70. Current value $62.73. Quarterly dividends are $.46 per share. Omega Healthcare Investors. 1 share purchased December 6 for $26.75. Stop loss sale February 2 for $26.00. Current value $26.59. Collected $0.66 in dividends. Ascena Retail Group. 3 shares purchased December 11 for $2.00. Stop loss sale of 2 shares on January 9 for $2.05. Current value $2.18. Macquarie Infrastructure. 1 share purchased December 26 for $64.18. Stop loss sale February 6 for $61.85. Current value $38.39. Gilead Sciences. Purchased 1 share January 19 for $81.30. Stop loss sell on February 5 for $80, repurchase February 5 for $79, dividend of $0.57. ProAssurance: Purchased 1 share January 12 for $54.98. Current value $46.15. General Electric: Purchased 3 shares on February 2 for $15.90 each. Current value $13.08. Altaba: Purchased 1 share at $80 on January 29. Current value: $67.55. CBL and Associates Properties: 10 shares purchased between January 29 and April 6 for an average cost of $4.84. Current price: $4.59. Will receive a dividend of $0.20 per share on April 17. Game Stop: Accidentally purchased on January 29 for $17.05. $0.38 dividend on 3/20. Current value $13.43. Sprint: Awarded one share because someone used my link. Current value: $5.15. Macy's: Purchased 2/5/18 for $24.00. 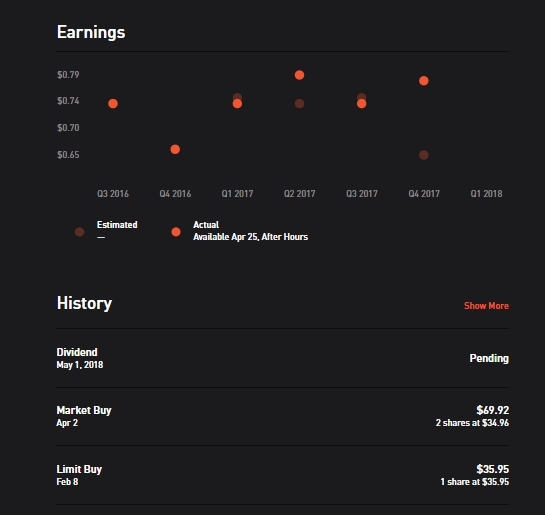 Dividend of $0.38 on April 6. Current value: $29.86. Government Properties Income Trust: 6 Shares purchased between March 1 and April 4 at average cost of $13.32. Current value: $12.50. Liberty All-Star Equity Fund: Ten shares purchased March 13 for $6.40 each; four shares purchased April 2 for $6.00 each. Current value: $6.09. Most of these stocks were things I read about on various blogs or on Seeking Alpha. I did not do extensive research,no did I invest a pile of money in any one stock. I have decided that I have enough now. If I want to put more money in the stock market, I am either going to buy more shares of what I have, or sell something I have and buy shares in a new company. If you would like to invest via Robinhood, please use my link. You'll get a free share of stock, and so will I. Last time someone used my link I got a share of Sprint. How was the first quarter of 2018 for you?